Turnbuckle is a device that usually consists of a link with screw threads at both ends, which is turned to bring the ends closer together. It is also known as stretching screw or bottle screw, it is used in hoisting or rigging operations. 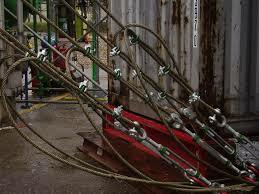 This should be of weld less construction and fabricated from alloy steel. A turnbuckle is a 3-piece metal coupling device, usually comprised of internal screw threads along-with a long sleeve at both ends. It normally consists of two threaded eye bolts, one screwed into each end of a small metal frame, one with a left-hand thread and the other with a right-hand thread. The tension can be adjusted by rotating the frame / central nut. So that they can be pulled together or pushed farther. The buckle is rotated clockwise, the screws eject out of the body, thereby releasing tension. And when it is turned in anti-clockwise direction, the screws on the other hand are driven towards the center, thereby increasing tension. The threaded regions of the turnbuckle either feature a hook or screw-eye at the non-threaded end. 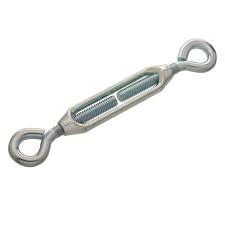 It is used to fasten wires, cables, ropes, or shafts, which are either attached to an anchor point or to other cables, including ropes and shafts. When they are supplied with hook end fittings, ensure that the hooks are fitted with safety catches. If the turnbuckle is to be used in an application where vibration is present, it is extremely important to lock the frame to the end fittings to prevent it from turning and loosening. Lock nuts or jam nuts should not be used and add greatly to the load in the screw thread. Use wire instead. Turnbuckles should be inspected frequently for cracks in the end fittings, deformed or bent rods and bodies, cracks and bends around the internally threaded portion and signs of thread damage.